Fenugreek is an annual plant in the family ‘Fabaceae’. It is cultivated worldwide as a semi-arid crop, and its seeds are a common ingredient in dishes but it can also be used as an herb or vegetable. It is the main ingredient of curry powders and widely used in Indian curry dishes. Fenugreek grows to about two feet (60cm), with yellow/white flowers and long yellow seed pods. It likes a full sun and well-drained, neutral to slightly acid soil and it doesn't like to be transplanted. Fenugreek must be watered thoroughly. Actually the age of this plant determines how it should be used. The plant grows fast and can be harvested for its leaves at various times. 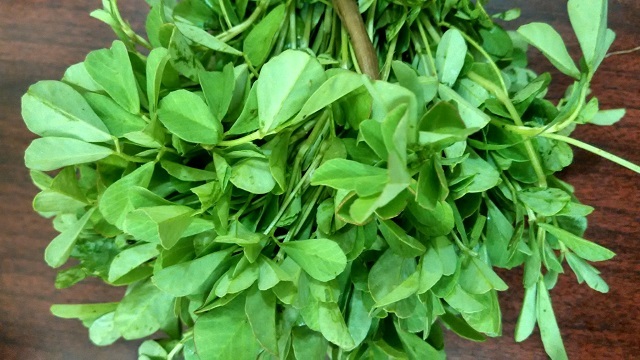 Young fenugreek seedlings (1-2 weeks of growth) are edible as micro-greens while older plants (3-6 weeks of growth) can be consumed as a leafy vegetable. Unlike many other herbs that thrive on neglect, Fenugreek does well in fertile soils and a lot of compost but does not require fertilizer at and plant should be five to six inches apart. Fenugreek is allergic to pesticides and that is why for you to succeed in this farming you have to go organic. Also the strong scent keeps off white flies making it pest free. Though this plant is not popular in most of the part in the world like it does in Indian families, its health benefits are worth a mention. This plant is often used to treat coughs and sore throat and is effective in treatment of Type 2 diabetes and can lower blood cholesterol levels and increase circulation. It is also often recommended as an herbal treatment for tinnitus. Fenugreek has fiber, iron, potassium and vitamin C.
It can be used to improve breast milk production in nursing mothers. It is also rich in many vital vitamins that are essential nutrients for optimum health, including thiamin, pyridoxine (Vitamin B6), folic acid, riboflavin, niacin, vitamin A, and vitamin-C. If used regularly, fenugreek may help control cholesterol, triglyceride as well as high blood sugar (glycemic) levels in diabetics.